Jack Van Duyn didn’t exactly cut an impressive figure. He was quite tall, but a gently protruding potbelly was accentuated by Australia’s least imposing set of shoulders. Underneath Jack’s crusty exterior lay a dank, stagnant pool of loneliness that was slowly consuming him. Jack’s world was full of pessimism, low expectations and failure. Missing out was normal. People like him were always at the end of the queue. I won’t bore you with the dozens more similar quotes I could include. I know I was meant to be enchanted by the fact that over the course of the book Jack confounds his loser status by behaving against type but this transformation would have been a lot more intriguing if any level of subtlety had been applied to it. Jack is a cabbie. One day as he is about to pick up a fare he notices two young African boys being assaulted by young men. On his own Jack would probably have done nothing but his would-be-passenger urges Jack to join him in rescuing the boys. The situation is resolved between our two heroes and a couple of police constables and that should have been the end of it. But Jack becomes smitten with the boys’ mother, single Somali mum Farhia Mohammed, and when he finds a book Farhia must have dropped seizes the opportunity to reconnect with her. Jack subsequently becomes involved in his passenger’s botched drug deal, a fight within the Somali community and soon has both ASIO and mysterious drug kingpins on his tail. Alas that summary makes the story sound more interesting than it actually was. Although it’s a quick and short read at 240 pages it doesn’t reach any dramatic or comedic heights, is entirely predictable and almost entirely unbelievable. That wouldn’t have mattered quite so much if the attendant social commentary had been engaging but that too was laid on with an over-sized trowel rather than the artist’s brush I might have hoped for. To save you the trouble of finding our for yourself what it boils down to is this: people, even people who are different from us, are generally OK if you take the time to get to know them. 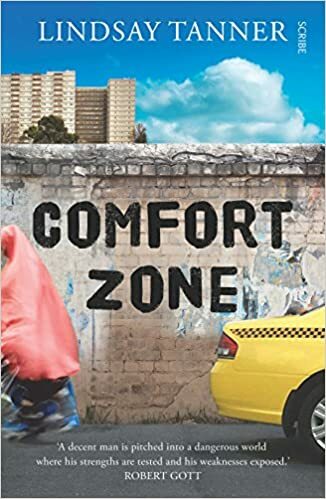 I was going to say that if COMFORT ZONE had been written by someone else my reaction to it might have been different as I wouldn’t have had prior expectations of its author. But I am pretty confident the book would never have been published without ‘former federal government minister’ attached to the author’s name. So I think I was justified in having an expectation that the book would use Tanner’s relatively rare experiences to offer genuine insight into the complexities of modern inner city life rather than the thinly veiled lament about Green voters spoiling a once wondrous place (for non Australians following along Tanner’s former seat has been in the hands of the Australian Greens since 2010). When combined with overly stereotypical characterisations and some truly clunky dialogue I really could give a one word review: disappointing. Jack Van Duyn is stuck in his comfort zone. A pot-bellied, round-shouldered cabbie in his mid-fifties, Jack lives alone, has few friends, and gets very little out of life. He has a negative opinion of most other people — especially refugees, bankers, politicians, and welfare bludgers.Jack doesn’t know it, but his life is about to be turned upside down. A minor altercation in a kids’ playground at an inner-city high-rise estate catapults Jack into a whirlpool of drug-dealing, ASIO intrigue, international piracy, and criminal violence. And he can’t escape, because he doesn’t want to: he’s fallen in love with the beautiful Somali single mum who’s at the centre of it all. some unpleasant truths about himself. After decades in the doldrums, can he rise to the challenge when the heat’s on? 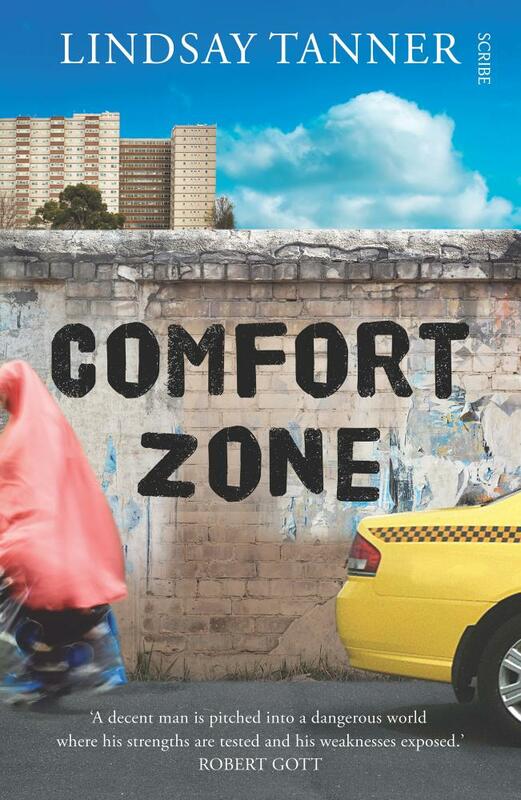 What this novel points out very clearly is how very rarely most of us do things outside our comfort zone. Actually our hero Jack Van Duyn wouldn’t have got outside his if it hadn’t been for his passenger who really dragged him into it. They intervened when some older kids were attacking some young Somali children in a playground. Jack finds himself attracted to the boy’s mother and going out of his way to help her. But that lands him in a heap of trouble. There is a comic vein to this novel but at the same time a serious look at some contemporary Australian social issues. That is where the author’s knowledge and awareness stand him in good stead. Jack finds himself hunted by ASIO who say he is consorting with a possible terrorist, as well as being potentially involved in drug running. He is very attracted to the young Somali widow and finds himself going out of his way to help her. By the end of the novel he recognises that his life has been changed. Jack also knows some interesting “fixers” who help solve his problems. To use a common idiom, Jack isn’t the sharpest knife in the box, but he is a nice man, even if he is a bit of a slob. I found his character growing and my sympathy for him expanding as the novel developed. I am not sure the novel is really crime fiction, but maybe it is on the outer edges of the genre – crimes are certainly committed. Part of the story is about how our refugee populations bring with them problems that can’t simply be solved by the act of coming to a new country.A pretty quick and interesting read. Lindsay Tanner was the minister for finance and deregulation in the Rudd-Gillard governments and held the seat of Melbourne for the ALP from 1993 to 2010. Having retired from politics at the 2010 federal election, he is now special adviser to Lazard Australia, and is a vice-chancellor’s fellow and adjunct professor at Victoria University. Mr Tanner is the author of several previous books, including Politics with Purpose (2012) and Sideshow (2011), also published by Scribe.